Carefully composed around a sunny central deck, this house by Porter Architects deftly navigates strict local planning requirements using a rational design that is interspersed with surprises. Otherwise restrictive planning controls allowed for an elevated design with useable undercroft space. 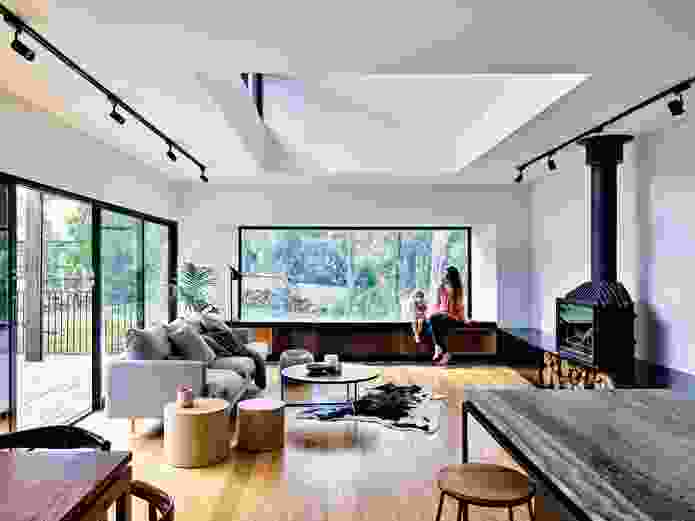 One of the first things Nathan Porter of Porter Architects tells me about this project is that the main goal was to have “a clear, organized plan.” He also mentions a love of Robin Boyd’s clear and ideas-driven planning. The often quoted but seldom achieved goal of architectural “simplicity” was in the back of my mind as we walked through the house. 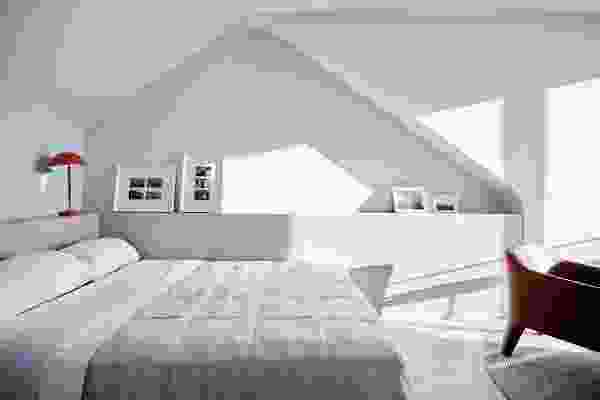 However, it quickly became evident that Porter Architects had indeed succeeded in creating a plan with distinct clarity. 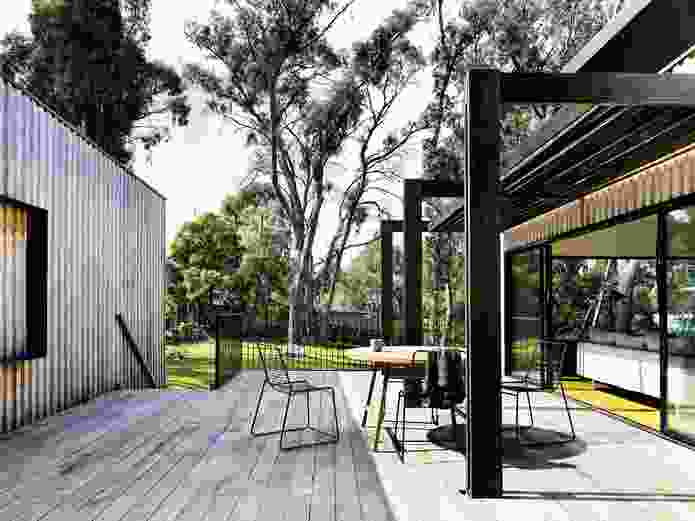 The simplicity comes from the division of the house into four zones: two flanking pavilions, one public and one private; a transitional entry piece connecting the two tubelike forms; and a large deck, creating a platform for indoor–outdoor living. 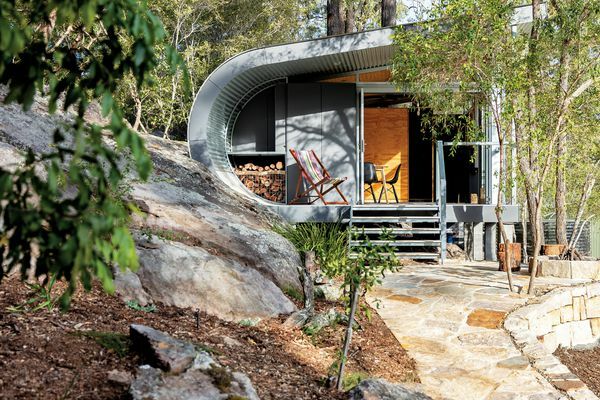 The site is a curiously hidden cul-de-sac with a steeply sloping topography and dense groves of beautiful eucalypts. It is only minutes from the centre of Ballarat, but we could equally have just driven two hours deep into the bush. Nathan says his partner stumbled onto this vacant and secluded site almost five years ago, having scoured Ballarat’s stock of ageing fixer-uppers before succumbing to the temptation to design something tailored to their needs, combined with an architect’s insatiable desire to use their own home as a testing ground for ideas. The potential for fantastic views over Ballarat didn’t hurt either. 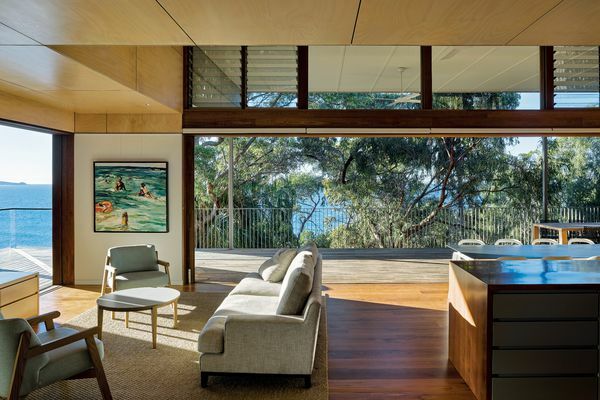 A framed view makes the eucalypts appear endlessly tall, one of a series of “special moments” in each space. 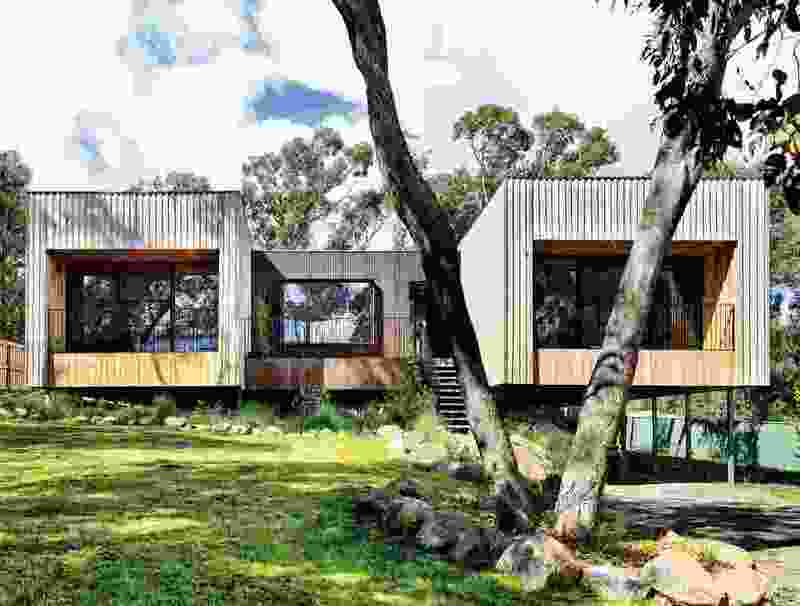 The site was, however, covered by incredibly restrictive planning controls, protecting both the native vegetation and the koalas in the neighbouring Woowookarung Regional Park. This reduced the envelope for development down to a smallish square in the middle of the block, limiting the ability to experiment with siting and the creative use of site contours. Serendipitously, there existed a strong desire to elevate the house off the ground and use the resulting undercroft – something that the planning controls allowed for. The planning of the house, Nathan says, was the result of twenty fully realized and discarded options, though the initial notion of forming four zones remained throughout. Entry into the house is through the transitional zone, positioned to frame long views of the trees through the deck pergolas. 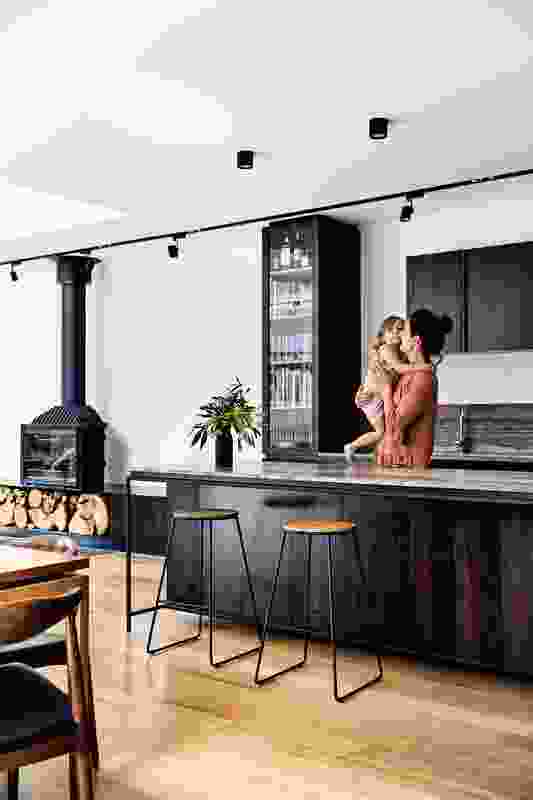 There is also an open and flexible space, currently used for play, which is effectively a spillover area that will adapt to the family’s needs over time. This largely glazed space bridges the two pavilions, opening to the central deck to lengthen it dramatically and to allow observation across the pavilions from nearly anywhere in the house. In the southern pavilion, the kitchen and living spaces reveal a new experience, with a pop-up skillion roof admitting generous amounts of northern light and an enormous picture window at the end of the space. The controlled view through this window frames the trunks of the eucalypts, giving them the appearance of being endlessly tall. Tucked in behind the kitchen in this wing is the main bedroom. Taking full advantage of the western views over Ballarat, this space is accessed through a deep threshold of dark timber wardrobes, reinforcing a sense of privacy. The north-facing living and kitchen pavilion extends to a large central deck, one of the four zones of the house. In all of his projects, Nathan has pursued the notion of “special moments” within each space, whether it be a long framed view or the manipulation of volume through the ceiling plane. “It’s about a slow reveal of elements that aren’t all on display at once,” he says, an approach that nurtures a depth of experience, unfolding new surprises within the highly rational plan to keep you guessing. The opposing “private” pavilion to the north contains a functional wing of bedrooms and crisply detailed amenities, all capturing generous amounts of northern light and views. 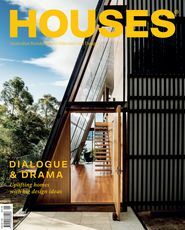 The finishes in the project were chosen for their honesty, such as the earthy tones in the stone of the specially selected kitchen benches; or to reduce the project’s ecological footprint, such as the laborious but rewarding use of recycled oak in the flooring or the blackbutt decking outside. The finishes also subtly support the project’s parti, with the two pavilions reflected in the duality of contrasting light- and dark-toned timbers in the joinery. Externally, the palette is a simple one of radially sawn board and batten cladding in silvertop ash. 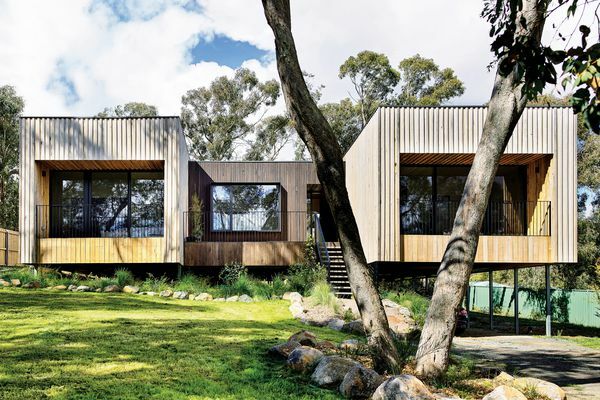 In addition to the ecologically sound use of the timber, this is also a considered design choice, with the battens laid vertically to sit harmoniously within the tall and straight stands of eucalypts. The cladding is also used to further the notion of the tubes, with the boards drawn cleverly into the deep balcony reveals as if these were two hovering slabs of solid timber. Despite the onerous restrictions placed on the project, the resulting home is an open, breezy and rational delight that carries no traces of the burden placed upon it. 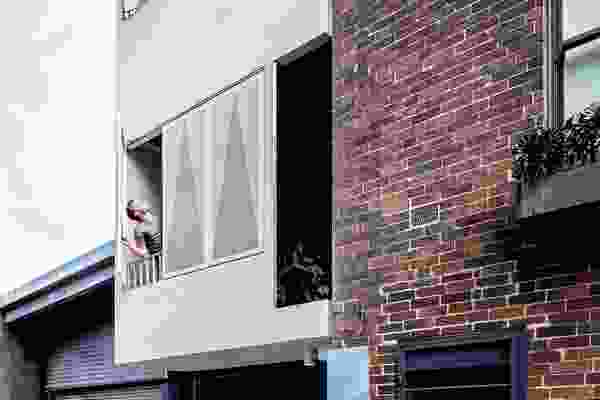 While it would no doubt serve the archi tect’s young family well for many a year, hints from Nathan of a restless desire to work on version twenty-one might see this building’s successor arrive sooner rather than later. Tasmanian oak ply in Feast Watson ‘Liming White’; Lysaght Trimdek in Colorbond ‘Monument’; Kingspan and Earthwool insulation. Radial Timber silvertop ash boad and batten cladding in oil finish and shiplap cladding in Sikkens Cetol ‘Ebony’. CSR Gyprock plas terboard in Dulux ‘Natural White’. Architectural Window Systems aluminium frames in Colorbond ‘Night Sky’ from Acme 1; Viridian glazing. Tasmanian oak solid-core veneer doors in Feast Watson ‘Black Japan’; custom front door pull in matt black powdercoat; Lane doorhandles. Recycled Tasmanian oak flooring from Lal Lal Demolitions; Fibonacci Stone Bedrock terrazzo tiles; Stonewall carpet from Red Door. ArkosLight IO Surface spotlights from Sonic Lighting; Ecogem LED downlights. Tasmanian oak veneer joinery in Feast Watson ‘Black Japan’; travertine benchtop and splashback; Viali rangehood; Westinghouse cooker; Asko dishwasher; KDK sink from Plumbtec; spout from Highgrove Bathrooms. 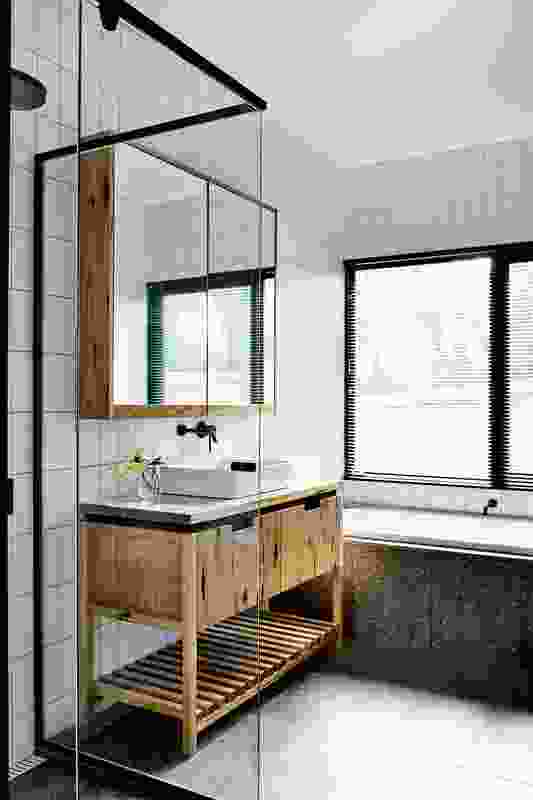 Solid Tasmanian oak joinery; Fibonacci Stone Bedrock terrazzo tiles; white subway tiles from Ballarat Tiles; Phoenix tapware in matt black from Plumbtec; bath and basin from Highgrove Bathrooms; Caroma in-wall cistern. Cheminees Philippe Radiante 800 wood heater from Wignells of Melbourne; Mac Hydronics hydronic floor heating. Pyrenees Timber blackbutt decking in Intergrain sealer; recycled brick front steps from Lal Lal Demolitions; native tubestock from Avalon Nursery. Custom dining table designed and built by the architect. A combination of recycled timbers and natural stone lends an earthy quality to the kitchen and dining spaces. 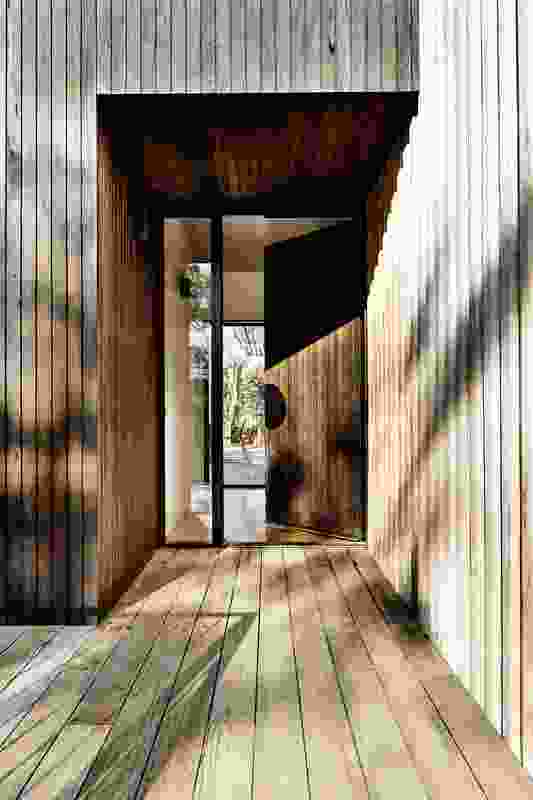 Opening onto a transition zone that connects the two pavilions, the entry is enveloped by locally sourced timber. Crisply detailed joinery in contrasting light- and dark-toned timbers accentuates the plan’s duality.